Enjoy an evening out with fellow NIU alumni and prospective students, experiencing art from around the world at the National Museum of Mexican Art, a contemporary gallery in Chicago. 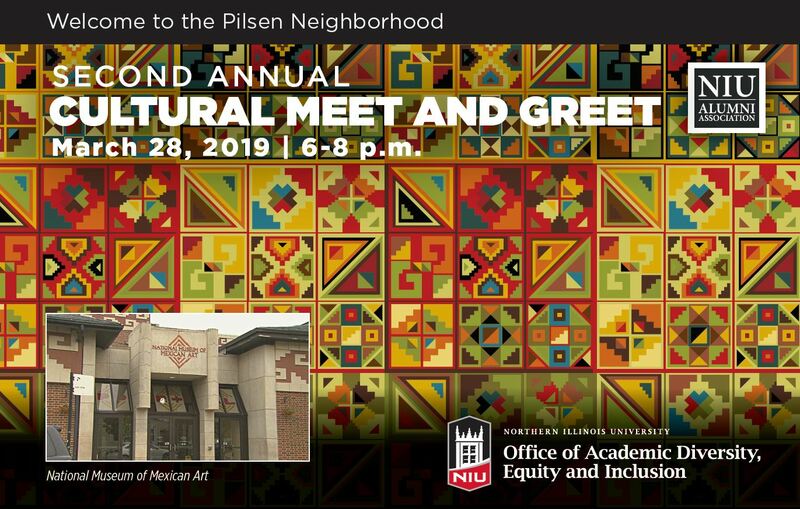 Reunite with classmates, meet prospective students and learn more about the Diversity and Cultural Resource Centers, programs and new initiatives at NIU. Hors d’oeuvres and beverages will be served during the event, which runs from 6 - 8 p.m. Your hostess, NIU’s Chief Diversity Officer Vernese Edghill-Walden, Ph.D., will share the progress of NIU’s diversity and inclusion efforts, while celebrating the roles the Diversity and Cultural Resource Centers and key programs play in providing student success. NIU has a diverse group of centers and programs who will join us, including the Asian American Resource Center, Black Alumni Council, Center for Black Studies, CHANCE Program, Disability Resource Center, Gender and Sexuality Resource Center, Latino Alumni Council, Latino Resource Center, Military and Post-Traditional Student Services and Office of Undergraduate Admissions. The cost is $10 for NIU Alumni Association members and $15 for nonmembers.